This article is about mystical traditions. For mystical experience, see mystical experience. The term "mysticism" has Ancient Greek origins with various historically determined meanings. [web 1][web 2] Derived from the Greek word μύω, meaning "to close" or "to conceal",[web 2] mysticism referred to the biblical liturgical, spiritual, and contemplative dimensions of early and medieval Christianity. During the early modern period, the definition of mysticism grew to include a broad range of beliefs and ideologies related to "extraordinary experiences and states of mind". In modern times, "mysticism" has acquired a limited definition, with broad applications, as meaning the aim at the "union with the Absolute, the Infinite, or God". [web 1] This limited definition has been applied to a wide range of religious traditions and practices,[web 1] valuing "mystical experience" as a key element of mysticism. Broadly defined, mysticism can be found in all religious traditions, from indigenous religions and folk religions like shamanism, to organised religions like the Abrahamic faiths and Indian religions, and modern spirituality, New Age and New Religious Movements. Since the 1960s scholars have debated the merits of perennial and constructionist approaches in the scientific research of "mystical experiences". The perennial position is now "largely dismissed by scholars", most scholars using a contextualist approach, which takes the cultural and historical context into consideration. The related noun μύστης (mustis or mystis, singular) means the initiate, the person initiated to the mysteries. [web 5] According to Ana Jiménez San Cristobal in her study of Greco-Roman mysteries and Orphism, the singular form μύστης and the plural form μύσται are used in ancient Greek texts to mean the person or persons initiated to religious mysteries. These followers of mystery religions belonged to a select group, where access was only gained through an initiation. She finds that the terms were associated with the term βάκχος (Bacchus), which was used for a special class of initiates of the Orphic mysteries. The terms are first found connected in the writings of Heraclitus. Such initiates are identified in texts with the persons who have been purified and have performed certain rites. A passage of the Cretans by Euripides seems to explain that the μύστης (initiate) who devotes himself to an ascetic life, renounces sexual activities, and avoids contact with the dead becomes known as βάκχος. Such initiates were believers in the god Dionysus Bacchus who took on the name of their god and sought an identification with their deity. Until the sixth century the practice of what is now called mysticism was referred to by the term contemplatio, c.q. theoria. According to Johnson, "[b]oth contemplation and mysticism speak of the eye of love which is looking at, gazing at, aware of divine realities." According to Peter Moore, the term "mysticism" is "problematic but indispensable." It is a generic term which joins together into one concept separate practices and ideas which developed separately, According to Dupré, "mysticism" has been defined in many ways, and Merkur notes that the definition, or meaning, of the term "mysticism" has changed through the ages. [web 1] Moore further notes that the term "mysticism" has become a popular label for "anything nebulous, esoteric, occult, or supernatural." Parsons warns that "what might at times seem to be a straightforward phenomenon exhibiting an unambiguous commonality has become, at least within the academic study of religion, opaque and controversial on multiple levels". Because of its Christian overtones, and the lack of similar terms in other cultures, some scholars regard the term "mysticism" to be inadequate as a useful descriptive term. Other scholars regard the term to be an inauthentic fabrication,[web 1] the "product of post-Enlightenment universalism." McGinn notes that the term unio mystica, although it has Christian origins, is primarily a modern expression. McGinn argues that "presence" is more accurate than "union", since not all mystics spoke of union with God, and since many visions and miracles were not necessarily related to union. He also argues that we should speak of "consciousness" of God's presence, rather than of "experience", since mystical activity is not simply about the sensation of God as an external object, but more broadly about "new ways of knowing and loving based on states of awareness in which God becomes present in our inner acts." Mysticism involves an explanatory context, which provides meaning for so-called mystical and visionary experiences, and related experiences like trances. According to Dan Merkur, mysticism may relate to any kind of ecstasy or altered state of consciousness, and the ideas and explanations related to them. [web 1][note 6] Parsons stresses the importance of distinguishing between temporary experiences and mysticism as a process, which is embodied within a "religious matrix" of texts and practices. [note 7] Richard Jones does the same. Peter Moore notes that mystical experience may also happen in a spontaneous and natural way, to people who are not committed to any religious tradition. These experiences are not necessarily interpreted in a religious framework. Ann Taves asks by which processes experiences are set apart and deemed religious or mystical. According to Evelyn Underhill, illumination is a generic English term for the phenomenon of mysticism. The term illumination is derived from the Latin illuminatio, applied to Christian prayer in the 15th century. Comparable Asian terms are bodhi, kensho and satori in Buddhism, commonly translated as "enlightenment", and vipassana, which all point to cognitive processes of intuition and comprehension. According to Wright, the use of the western word enlightenment is based on the supposed resemblance of bodhi with Aufklärung, the independent use of reason to gain insight into the true nature of our world, and there are more resemblances with Romanticism than with the Enlightenment: the emphasis on feeling, on intuitive insight, on a true essence beyond the world of appearances. In the Hellenistic world, 'mystical' referred to "secret" religious rituals like the Eleusinian Mysteries. [web 2] The use of the word lacked any direct references to the transcendental. A "mystikos" was an initiate of a mystery religion. In early Christianity the term "mystikos" referred to three dimensions, which soon became intertwined, namely the biblical, the liturgical and the spiritual or contemplative. The biblical dimension refers to "hidden" or allegorical interpretations of Scriptures. [web 2] The liturgical dimension refers to the liturgical mystery of the Eucharist, the presence of Christ at the Eucharist. [web 2] The third dimension is the contemplative or experiential knowledge of God. Until the sixth century, the Greek term theoria, meaning "contemplation" in Latin, was used for the mystical interpretation of the Bible. The link between mysticism and the vision of the Divine was introduced by the early Church Fathers, who used the term as an adjective, as in mystical theology and mystical contemplation. Under the influence of Pseudo-Dionysius the Areopagite the mystical theology came to denote the investigation of the allegorical truth of the Bible, and "the spiritual awareness of the ineffable Absolute beyond the theology of divine names." Pseudo-Dionysius' Apophatic theology, or "negative theology", exerted a great influence on medieval monastic religiosity. It was influenced by Neo-Platonism, and very influential in Eastern Orthodox Christian theology. In western Christianity it was a counter-current to the prevailing Cataphatic theology or "positive theology". Theoria enabled the Fathers to perceive depths of meaning in the biblical writings that escape a purely scientific or empirical approach to interpretation. The Antiochene Fathers, in particular, saw in every passage of Scripture a double meaning, both literal and spiritual. Later, theoria or contemplation came to be distinguished from intellectual life, leading to the identification of θεωρία or contemplatio with a form of prayer distinguished from discursive meditation in both East and West. This threefold meaning of "mystical" continued in the Middle Ages. According to Dan Merkur, the term unio mystica came into use in the 13th century as a synonym for the "spiritual marriage," the ecstasy, or rapture, that was experienced when prayer was used "to contemplate both God’s omnipresence in the world and God in his essence. "[web 1] Under the influence of Pseudo-Dionysius the Areopagite the mystical theology came to denote the investigation of the allegorical truth of the Bible, and "the spiritual awareness of the ineffable Absolute beyond the theology of divine names." Pseudo-Dionysius' Apophatic theology, or "negative theology", exerted a great influence on medieval monastic religiosity, although it was mostly a male religiosity, since women were not allowed to study. It was influenced by Neo-Platonism, and very influential in Eastern Orthodox Christian theology. In western Christianity it was a counter-current to the prevailing Cataphatic theology or "positive theology". It is best known nowadays in the western world from Meister Eckhart and John of the Cross. Under the influence of Perennialism, which was popularised in both the west and the east by Unitarianism, Transcendentalists and Theosophy, mysticism has been applied to a broad spectrum of religious traditions, in which all sorts of esotericism and religious traditions and practices are joined together. The term mysticism was extended to comparable phenomena in non-Christian religions,[web 1] where it influenced Hindu and Buddhist responses to colonialism, resulting in Neo-Vedanta and Buddhist modernism. In the contemporary usage "mysticism" has become an umbrella term for all sorts of non-rational world views, parapsychology and pseudoscience. William Harmless even states that mysticism has become "a catch-all for religious weirdness". Within the academic study of religion the apparent "unambiguous commonality" has become "opaque and controversial". The term "mysticism" is being used in different ways in different traditions. Some call to attention the conflation of mysticism and linked terms, such as spirituality and esotericism, and point at the differences between various traditions. 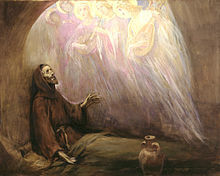 Based on various definitions of mysticism, namely mysticism as an experience of union or nothingness, mysticism as any kind of an altered state of consciousness which is attributed in a religious way, mysticism as "enlightenment" or insight, and mysticism as a way of transformation, "mysticism" can be found in many cultures and religious traditions, both in folk religion and organized religion. These traditions include practices to induce religious or mystical experiences, but also ethical standards and practices to enhance self-control and integrate the mystical experience into daily life. According to Dan Merkur, shamanism may be regarded as a form of mysticism, in which the world of spirits is accessed through religious ecstasy. [web 1] According to Mircea Eliade shamanism is a "technique of religious ecstasy." The term "shamanism" was first applied by western anthropologists to the ancient religion of the Turks and Mongols, as well as those of the neighboring Tungusic and Samoyedic-speaking peoples. The term is also used to describe similar magico-religious practices found within the ethnic religions of other parts of Asia, Africa, Australasia and the Americas. For instance, Louisiana Voodoo, Haitian Vodou, West African Vodun, Dominican Vudú and Hoodoo are related folk-religions with ecstatic elements. Neoshamanism refers to "new"' forms of shamanism, or methods of seeking visions or healing, typically practiced in Western countries. Neoshamanism comprises an eclectic range of beliefs and practices that involve attempts to attain altered states and communicate with a spirit world, and is associated with New Age practices. The Eleusinian Mysteries, (Greek: Ἐλευσίνια Μυστήρια) were annual initiation ceremonies in the cults of the goddesses Demeter and Persephone, held in secret at Eleusis (near Athens) in ancient Greece. The mysteries began in about 1600 B.C. in the Mycenean period and continued for two thousand years, becoming a major festival during the Hellenic era, and later spreading to Rome. Numerous scholars have proposed that the power of the Eleusinian Mysteries came from the kykeon's functioning as an entheogen. The apophatic theology, or "negative theology", of Pseudo-Dionysius the Areopagite (6th c.) exerted a great influence on medieval monastic religiosity, both in the East and (by Latin translation) in the West. Pseudo-Dionysius applied Neoplatonic thought, particularly that of Proclus, to Christian theology. The Orthodox Church has a long tradition of theoria (intimate experience) and hesychia (inner stillness), in which contemplative prayer silences the mind to progress along the path of theosis (deification). Symeon believed that direct experience gave monks the authority to preach and give absolution of sins, without the need for formal ordination. While Church authorities also taught from a speculative and philosophical perspective, Symeon taught from his own direct mystical experience, and met with strong resistance for his charismatic approach, and his support of individual direct experience of God's grace. The High Middle Ages saw a flourishing of mystical practice and theorization in western Roman Catholicism, corresponding to the flourishing of new monastic orders, with such figures as Guigo II, Hildegard of Bingen, Bernard of Clairvaux, the Victorines, all coming from different orders, as well as the first real flowering of popular piety among the laypeople. The philokalia, an ancient method of Eastern Orthodox mysticism, was promoted by the twentieth century Traditionalist School. The allegedly inspired or "channeled" work A Course in Miracles represents a blending of non-denominational Christian and New Age ideas. Many western esoteric traditions and elements of modern spirituality have been regarded as "mysticism," such as Gnosticism, Transcendentalism, Theosophy, the Fourth Way, and Neo-Paganism. Modern western spiritually and transpersonal psychology combine western psycho-therapeutic practices with religious practices like meditation to attain a lasting transformation. Nature mysticism is an intense experience of unification with nature or the cosmic totality, which was popular with Romantic writers. Kabbalah emerged, after earlier forms of Jewish mysticism, in 12th to 13th century Southern France and Spain, becoming reinterpreted in the Jewish mystical renaissance of 16th-century Ottoman Palestine. It was popularised in the form of Hasidic Judaism from the 18th century forward. 20th-century interest in Kabbalah has inspired cross-denominational Jewish renewal and contributed to wider non-Jewish contemporary spirituality, as well as engaging its flourishing emergence and historical re-emphasis through newly established academic investigation. A practitioner of this tradition is nowadays known as a ṣūfī (صُوفِيّ), or, in earlier usage, a dervish. The origin of the word "Sufi" is ambiguous. One understanding is that Sufi means wool-wearer; wool wearers during early Islam were pious ascetics who withdrew from urban life. Another explanation of the word "Sufi" is that it means 'purity'. Sufis generally belong to a khalqa, a circle or group, led by a Sheikh or Murshid. Sufi circles usually belong to a Tariqa which is the Sufi order and each has a Silsila, which is the spiritual lineage, which traces its succession back to notable Sufis of the past, and often ultimately to the last prophet Muhammed or one of his close associates. The turuq (plural of tariqa) are not enclosed like Christian monastic orders; rather the members retain an outside life. Membership of a Sufi group often passes down family lines. Meetings may or may not be segregated according to the prevailing custom of the wider society. An existing Muslim faith is not always a requirement for entry, particularly in Western countries. 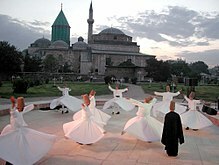 Sama, which takes the form of music and dance — the whirling dance of the Mevlevi dervishes is a form well known in the West. Visiting holy places, particularly the tombs of Sufi saints, in order to remember death and the greatness of those who have passed. The aims of Sufism include: the experience of ecstatic states (hal), purification of the heart (qalb), overcoming the lower self (nafs), extinction of the individual personality (fana), communion with God (haqiqa), and higher knowledge (marifat). Some sufic beliefs and practices have been found unorthodox by other Muslims; for instance Mansur al-Hallaj was put to death for blasphemy after uttering the phrase Ana'l Haqq, "I am the Truth" (i.e. God) in a trance. Notable classical Sufis include Jalaluddin Rumi, Fariduddin Attar, Sultan Bahoo, Sayyed Sadique Ali Husaini, Saadi Shirazi and Hafez, all major poets in the Persian language. Omar Khayyam, Al-Ghazzali and Ibn Arabi were renowned scholars. Abdul Qadir Jilani, Moinuddin Chishti, and Bahauddin Naqshband founded major orders, as did Rumi. Rabia Basri was the most prominent female Sufi. Sufism first came into contact with the Judeo-Christian world during the Moorish occupation of Spain. An interest in Sufism revived in non-Muslim countries during the modern era, led by such figures as Inayat Khan and Idries Shah (both in the UK), Rene Guenon (France) and Ivan Aguéli (Sweden). Sufism has also long been present in Asian countries that do not have a Muslim majority, such as India and China. In Hinduism, various sadhanas aim at overcoming ignorance (avidhya) and transcending the limited identification with body, mind and ego to attain moksha. Hinduism has a number of interlinked ascetic traditions and philosophical schools which aim at moksha and the acquisition of higher powers. With the onset of the British colonisation of India, those traditions came to be interpreted in western terms such as "mysticism", drawing equivalents with western terms and practices. Yoga is the physical, mental, and spiritual practices or disciplines which aim to attain a state of permanent peace. Various traditions of yoga are found in Hinduism, Buddhism and Jainism. The Yoga Sūtras of Patañjali defines yoga as "the stilling of the changing states of the mind," which is attained in samadhi. Classical Vedanta gives philosophical interpretations and commentaries of the Upanishads, a vast collection of ancient hymns. At least ten schools of Vedanta are known, of which Advaita Vedanta, Vishishtadvaita, and Dvaita are the best known. Advaita Vedanta, as expounded by Adi Shankara, states that there is no difference between Atman and Brahman. The best-known subschool is Kevala Vedanta or mayavada as expounded by Adi Shankara. Advaita Vedanta has acquired a broad acceptance in Indian culture and beyond as the paradigmatic example of Hindu spirituality. In contrast Bhedabheda-Vedanta emphasizes that Atman and Brahman are both the same and not the same, while Dvaita Vedanta states that Atman and God are fundamentally different. In modern times, the Upanishads have been interpreted by Neo-Vedanta as being "mystical". Various Shaivist traditions are strongly nondualistic, such as Kashmir Shaivism and Shaiva Siddhanta. Tantra is the name given by scholars to a style of meditation and ritual which arose in India no later than the fifth century AD. Tantra has influenced the Hindu, Bön, Buddhist, and Jain traditions and spread with Buddhism to East and Southeast Asia. Tantric ritual seeks to access the supra-mundane through the mundane, identifying the microcosm with the macrocosm. The Tantric aim is to sublimate (rather than negate) reality. The Tantric practitioner seeks to use prana (energy flowing through the universe, including one's body) to attain goals which may be spiritual, material or both. Tantric practice includes visualisation of deities, mantras and mandalas. It can also include sexual and other (antinomian) practices. The goal of Sikhism is to be one with God. Sikhs meditate as a means to progress towards enlightenment; it is devoted meditation simran that enables a sort of communication between the Infinite and finite human consciousness. There is no concentration on the breath but chiefly the remembrance of God through the recitation of the name of God and surrender themselves to Gods presence often metaphorized as surrendering themselves to the Lord's feet. According to Oliver, Buddhism is mystical in the sense that it aims at the identification of the true nature of our self, and live according to it. Buddhism originated in India, sometime between the 6th and 4th centuries BCE, but is now mostly practiced in other countries, where it developed into a number of traditions, the main ones being Therevada, Mahayana, and Vajrayana. Buddhism aims at liberation from the cycle of rebirth by self-control through meditation and morally just behaviour. Some Buddhist paths aim at a gradual development and transformation of the personality toward Nirvana, like the Theravada stages of enlightenment. Others, like the Japanese Rinzai Zen tradition, emphasize sudden insight, but nevertheless also prescribe intensive training, including meditation and self-restraint. Although Theravada does not acknowledge the existence of a theistic Absolute, it does postulate Nirvana as a transcendent reality which may be attained. It further stresses transformation of the personality through meditative practice, self-restraint, and morally just behaviour. According to Richard H. Jones, Theravada is a form of mindful extrovertive and introvertive mysticism, in which the conceptual structuring of experiences is weakened, and the ordinary sense of self is weakened. It is best known in the west from the Vipassana movement, a number of branches of modern Theravāda Buddhism from Burma, Laos, Thailand and Sri Lanka, and includes contemporary American Buddhist teachers such as Joseph Goldstein and Jack Kornfield. The Yogacara school of Mahayana investigates the workings of the mind, stating that only the mind (citta-mātra) or the representations we cognize (vijñapti-mātra),[note 20] really exist. In later Buddhist Mahayana thought, which took an idealistic turn,[note 21] the unmodified mind came to be seen as a pure consciousness, from which everything arises. [note 22] Vijñapti-mātra, coupled with Buddha-nature or tathagatagarba, has been an influential concept in the subsequent development of Mahayana Buddhism, not only in India, but also in China and Tibet, most notable in the Chán (Zen) and Dzogchen traditions. Chinese and Japanese Zen is grounded on the Chinese understanding of the Buddha-nature as one true's essence, and the Two truths doctrine as a polarity between relative and Absolute reality. Zen aims at insight one's true nature, or Buddha-nature, thereby manifesting Absolute reality in the relative reality. In Soto, this Buddha-nature is regarded to be ever-present, and shikan-taza, sitting meditation, is the expression of the already existing Buddhahood. Rinzai-zen emphasises the need for a break-through insight in this Buddha-nature, but also stresses that further practice is needed to deepen the insight and to express it in daily life, as expressed in the Three mysterious Gates, the Four Ways of Knowing of Hakuin, and the Ten Ox-Herding Pictures. The Japanese Zen-scholar D.T. Suzuki noted similarities between Zen-Buddhism and Christian mysticism, especially meister Eckhart. The Tibetan Vajrayana tradition is based on Madhyamaka philosophy and Tantra. In deity yoga, visualizations of deities are eventually dissolved, to realize the inherent emptiness of every-'thing' that exists. Dzogchen, which is being taught in both the Tibetan buddhist Nyingma school and the Bön tradition, focuses on direct insight into our real nature. It holds that "mind-nature" is manifested when one is enlightened, being nonconceptually aware (rigpa, "open presence") of one's nature, "a recognition of one's beginningless nature." Mahamudra has similarities with Dzogchen, emphasizing the meditational approach to insight and liberation. Taoist philosophy is centered on the Tao, usually translated "Way", an ineffable cosmic principle. The contrasting yet interdependent concepts of yin and yang also symbolise harmony, with Taoist scriptures often emphasing the Yin virtues of femininity, passivity and yieldingness. Taoist practice includes exercises and rituals aimed at manipulating the life force Qi, and obtaining health and longevity. [note 23] These have been elaborated into practices such as Tai chi, which are well known in the west. Today there is also occurring in the West what Richard Jones calls "the secularization of mysticism". That is the separation of meditation and other mystical practices from their traditional use in religious ways of life to only secular ends of purported psychological and physiological benefits. R. C. Zaehner distinguishes three fundamental types of mysticism, namely theistic, monistic and panenhenic ("all-in-one") or natural mysticism. The theistic category includes most forms of Jewish, Christian and Islamic mysticism and occasional Hindu examples such as Ramanuja and the Bhagavad Gita. The monistic type, which according to Zaehner is based upon an experience of the unity of one's soul,[note 24] includes Buddhism and Hindu schools such as Samhya and Advaita vedanta. Nature mysticism seems to refer to examples that do not fit into one of these two categories. Stace argues that doctrinal differences between religious traditions are inappropriate criteria when making cross-cultural comparisons of mystical experiences. Stace argues that mysticism is part of the process of perception, not interpretation, that is to say that the unity of mystical experiences is perceived, and only afterwards interpreted according to the perceiver’s background. This may result in different accounts of the same phenomenon. While an atheist describes the unity as “freed from empirical filling”, a religious person might describe it as “God” or “the Divine”. Neurophysiological origins, such as temporal lobe epilepsy. The theoretical study of mystical experience has shifted from an experiential, privatized and perennialist approach to a contextual and empirical approach. The experientalist approach sees mystical experience as a private expression of perennial truths, separate from its historical and cultural context. The contextual approach, which also includes constructionism and attribution theory, takes into account the historical and cultural context. [web 2] Neurological research takes an empirical approach, relating mystical experiences to neurological processes. The term "mystical experience" evolved as a distinctive concept since the 19th century, laying sole emphasis on the experiential aspect, be it spontaneous or induced by human behavior. Perennialists regard those various experience traditions as pointing to one universal transcendental reality, for which those experiences offer the proof. In this approach, mystical experiences are privatised, separated from the context in which they emerge. Well-known representatives are William James, R.C. Zaehner, William Stace and Robert Forman. The perennial position is "largely dismissed by scholars", but "has lost none of its popularity." In contrast, for the past decades most scholars have favored a constructionist approach, which states that mystical experiences are fully constructed by the ideas, symbols and practices that mystics are familiar with. Critics of the term "religious experience" note that the notion of "religious experience" or "mystical experience" as marking insight into religious truth is a modern development, and contemporary researchers of mysticism note that mystical experiences are shaped by the concepts "which the mystic brings to, and which shape, his experience". What is being experienced is being determined by the expectations and the conceptual background of the mystic. Richard Jones draws a distinction between "anticonstructivism" and "perennialism": constructivism can be rejected with respect to a certain class of mystical experiences without ascribing to a perennialist philosophy on the relation of mystical doctrines. One can reject constructivism without claiming that mystical experiences reveal a cross-cultural "perennial truth". For example, a Christian can reject both constructivism and perennialism in arguing that there is a union with God free of cultural construction. Constructivism versus anticonstructivism is a matter of the nature of mystical experiences while perennialism is a matter of mystical traditions and the doctrines they espouse. The perennial position is now "largely dismissed by scholars", and the contextual approach has become the common approach. Contextualism takes into account the historical and cultural context of mystical experiences. The attribution approach views "mystical experience" as non-ordinary states of consciousness which are explained in a religious framework. According to Proudfoot, mystics unconsciously merely attribute a doctrinal content to ordinary experiences. That is, mystics project cognitive content onto otherwise ordinary experiences having a strong emotional impact. This approach has been further elaborated by Ann Taves, in her Religious Experience Reconsidered. She incorporates both neurological and cultural approaches in the study of mystical experience. Neurological research takes an empirical approach, relating mystical experiences to neurological processes. This leads to a central philosophical issue: does the identification of neural triggers or neural correlates of mystical experiences prove that mystical experiences are no more than brain events or does it merely identify the brain activity occurring during a genuine cognitive event? The most common positions are that neurology reduces mystical experiences or that neurology is neutral to the issue of mystical cognitivity. Interest in mystical experiences and psychedelic drugs has also recently seen a resurgence. A philosophical issue in the study of mysticism is the relation of mysticism to morality. Albert Schweitzer presented the classic account of mysticism and morality being incompatible. Arthur Danto also argued that morality is at least incompatible with Indian mystical beliefs. Walter Stace, on the other hand, argued not only are mysticism and morality compatible, but that mysticism is the source and justification of morality. Others studying multiple mystical traditions have concluded that the relation of mysticism and morality is not as simple as that. ^ Note that Parmenides' "way of truth" may also be translated as "way of conviction." Parmenides (fl. late sixth or early fifth century BC), in his poem On Nature, gives an account of a revelation on two ways of inquiry. "The way of conviction" explores Being, true reality ("what-is"), which is "What is ungenerated and deathless,/whole and uniform, and still and perfect." "The way of opinion" is the world of appearances, in which one's sensory faculties lead to conceptions which are false and deceitful. Cook's translation "way of conviction" is rendered by other translators as "way of truth." ^ William James: "This is the everlasting and triumphant mystical tradition, hardly altered by differences of clime or creed. In Hinduism, in Neoplatonism, in Sufism, in Christian mysticism, in Whitmanism, we find the same recurring note, so that there is about mystical utterances an eternal unanimity which ought to make a critic stop and think, and which bring it about that the mystical classics have, as been said, neither birthday nor native land." Compare Plotinus, who argued that The One is radically simple, and does not even have self-knowledge, since self-knowledge would imply multiplicity. Nevertheless, Plotinus does urge for a search for the Absolute, turning inward and becoming aware of the "presence of the intellect in the human soul," initiating an ascent of the soul by abstraction or "taking away," culminating in a sudden appearance of the One. ^ Parsons: "...episodic experience and mysticism as a process that, though surely punctuated by moments of visionary, unitive, and transformative encounters, is ultimately inseparable from its embodied relation to a total religious matrix: liturgy, scripture, worship, virtues, theology, rituals, practice and the arts. ^ Larson: "A mystical experience is an intuitive understanding and realization of the meaning of existence – an intuitive understanding and realization which is intense, integrating, self-authenticating, liberating – i.e., providing a sense of release from ordinary self-awareness – and subsequently determinative – i.e., a primary criterion – for interpreting all other experience whether cognitive, conative, or affective." ^ Horne: "[M]ystical illumination is interpreted as a central visionary experience in a psychological and behavioural process that results in the resolution of a personal or religious problem. This factual, minimal interpretation depicts mysticism as an extreme and intense form of the insight seeking process that goes in activities such as solving theoretical problems or developing new inventions. ^ McGinn: "This is why the only test that Christianity has known for determining the authenticity of a mystic and her or his message has been that of personal transformation, both on the mystic's part and—especially—on the part of those whom the mystic has affected. ^ Metropolitan Hierotheos Vlachos: "Noetic prayer is the first stage of theoria." ^ Catholic Encyclopedia: "But it was Simeon, "the new theologian" (c. 1025-c. 1092; see Krumbacher, op. cit., 152–154), a monk of Studion, the "greatest mystic of the Greek Church" (loc. cit. ), who evolved the quietist theory so elaborately that he may be called the father of Hesychasm. For the union with God in contemplation (which is the highest object of our life) he required a regular system of spiritual education beginning with baptism and passing through regulated exercises of penance and asceticism under the guidance of a director. But he had not conceived the grossly magic practices of the later Hesychasts; his ideal is still enormously more philosophical than theirs." ^ Yogacara postulates an advaya (nonduality) of grahaka ("grasping," cognition) and gradya (the "grasped," cognitum). In Yogacara-thought, cognition is a modification of the base-consciousness, alaya-vijnana. According to the Lankavatara Sutra and the schools of Chan/Zen Buddhism, this unmodified mind is identical with the tathagata-garbha, the "womb of Buddhahood," or Buddha-nature, the nucleus of Buddhahood inherent in everyone. Both denoye the potentiality of attaining Buddhahood. In the Lankavatara-interpretation, tathagata-garbha as a potentiality turned into a metaphysical Absolute reality which had to be realised. ^ Extending to physical immortality: the Taoist pantheon includes Xian, or immortals. ^ a b c d e f g h King 2002, p. 15. ^ a b c d e f g h Paden 2009, p. 332. ^ Forman 1997, p. 197, note 3. ^ a b c McMahan 2008, p. 269, note 9. ^ a b c Moore 2005, p. 6356–6357. ^ a b c Johnson 1997, p. 24. ^ a b c d e f Moore 2005, p. 6355. ^ a b c d e f g h Parsons 2011, p. 3. ^ a b Harmless 2007, p. 14. ^ a b c Hori 1999, p. 47. ^ a b c d e Sharf 2000. ^ a b c Harmless 2007, pp. 10–17. ^ a b James 1982, p. 30. ^ McGinn 2005, p. 6334. ^ a b c McGinn 2006. ^ Mooney 2009, p. 7. ^ a b Parsons 2011, pp. 4–5. ^ Jones 2016, chapter 1. ^ Moore 2005, p. 6356. ^ a b c d Taves 2009. ^ a b Lidke 2005, p. 144. ^ a b Dupré 2005, p. 6341. ^ a b c King 2002, p. 195. ^ Breck, Scripture in Tradition, p. 37. ^ Cite error: The named reference ODCC was invoked but never defined (see the help page). ^ "Augustin Poulain, "Contemplation", in The Catholic Encyclopedia 1908". Archived from the original on 2012-01-13. Retrieved 2011-11-24. ^ Parsons 2011, p. 3-5. ^ Ben-Shakhar, Gershon; Bar, Marianna (2018-06-08). The Lying Machine: Mysticism and Pseudo-Science in Personality Assessment and Prediction. Taylor & Francis. ISBN 9781138301030. ^ Shermer, Michael; Linse, Pat (2002). The Skeptic Encyclopedia of Pseudoscience. ABC-CLIO. ISBN 9781576076538. ^ Smith, Jonathan C. (2011-09-26). Pseudoscience and Extraordinary Claims of the Paranormal: A Critical Thinker's Toolkit. John Wiley & Sons. ISBN 9781444358940. ^ Eburne, Jonathan (2018-09-18). Outsider Theory: Intellectual Histories of Questionable Ideas. U of Minnesota Press. ISBN 9781452958255. ^ "The New Age Embraces Shamanism". Christian Research Institute. ^ Theophan the Recluse, What Is prayer?. Cited in The Art of Prayer: An Orthodox Anthology, p.73, compiled by Igumen Chariton of Valamo, trans, E. Kadloubovsky and E.M. Palmer, ed. Timothy Ware, 1966, Faber & Faber, London. ^ "CATHOLIC ENCYCLOPEDIA: Hesychasm". www.newadvent.org. ^ Dupré 2005, p. 6342. ^ Johnson, Ian (25 April 2013). "China's Sufis: The Shrines Behind the Dunes". ^ Raju 1992, p. 177. ^ "The Sikh Review". 57 (7–12). Sikh Cultural Centre. 2009: 35. ^ a b Harvey 1995. ^ Belzen & Geels 2003, p. 7. ^ Jones 2016, p. 12. ^ a b Yuichi Kajiyama (1991). Minoru Kiyota and Elvin W. Jones (ed.). Mahāyāna Buddhist Meditation: Theory and Practice. Motilal Banarsidass. pp. 120–122, 137–139. ISBN 978-81-208-0760-0. ^ a b c Kochumuttom 1999, p. 5. ^ Peter Harvey, Consciousness Mysticism in the Discourses of the Buddha. In Karel Werner, ed., The Yogi and the Mystic. Curzon Press 1989, pages 96–97. ^ a b c Dumoulin 2005b. ^ Dumoulin 2005a, p. 168. ^ Maezumi & Glassman 2007, p. 54, 140. ^ Newman 2001, p. 587. ^ Harding 1996, p. 16–20. ^ a b Klein 2011, p. 265. ^ "Dzogchen - Rigpa Wiki". www.rigpawiki.org. ^ Klein & Tenzin Wangyal 2006, p. 4. ^ Richard H. Jones, Philosophy of Mysticism (SUNY Press, 2016), epilogue. ^ Stace 1960, p. chap. 1. ^ Hood 2003, p. 292. ^ Stace, Walter (1960). The Teachings of the Mystics. New York: The New American Library. pp. 20–21. ISBN 0-451-60306-0. ^ Stace, Walter (1960). The Teachings of the Mystics. New York: The New American Library. pp. 15–18. ISBN 0-451-60306-0. ^ Stace, Walter (1960). Mysticism and Philosophy. MacMillan. pp. 44–80. ^ a b c d e f g Moore 2005, p. 6357. ^ Katz 2000, p. 3. ^ Jones 2016, chapter 2; also see Jensine Andresen, "Introduction: Towards a Cognitive Science of Religion," in Jensine Andresen, ed., Religion in Mind. Cambridge: Cambridge University Press, 2001..
^ Newberg & d'Aquili 2008. ^ Newberg & Waldman 2009. ^ Jones 2016, chapter 4. ^ a b Devinsky 2003. ^ Picard 2013, p. 2496–2498. ^ Stace 1960, pp. 323–343. ^ Barnard & Kripal 2002. Dewhurst, K.; Beard, A. (2003). "Sudden religious conversions in temporal lobe epilepsy. 1970" (PDF). Epilepsy & Behavior. 4 (1): 78–87. doi:10.1016/S1525-5050(02)00688-1. PMID 12609232. Archived from the original (PDF) on 2007-09-30. Retrieved 2006-08-15. Puligandla, Ramakrishna (1997), Fundamentals of Indian Philosophy, New York: D.K. Printworld (P) Ltd.
^ a b c d e f g h i j k l m n o p q r s "Gellman, Jerome, "Mysticism", The Stanford Encyclopedia of Philosophy (Summer 2011 Edition), Edward N. Zalta (ed.)". Plato.stanford.edu. Retrieved 2013-11-06. ^ "μυώ". WordReference English-Greek Dictionary. WordReference.com. Retrieved April 24, 2016. ^ "3453. mueó". Strong's Concordance. Bible Hub. Retrieved April 24, 2016. ^ a b c "3466. mustérion". Strong's Concordance. Bible Hub. Retrieved April 24, 2016. ^ a b c d Peter Fenwick (1980). "The Neurophysiology of the Brain: Its Relationship to Altered States of Consciousness (With emphasis on the Mystical Experience)". Wrekin Trust. Archived from the original on 14 February 2016. Retrieved 14 November 2015. Wikimedia Commons has media related to Mysticism. Wikisource has the text of the 1911 Encyclopædia Britannica article Mysticism.